Boating is a great activity that can be shared with the entire family. However, because it can be seasonal, you’ll need to perform a few check-ups to get ready for first trip of the season. Some are safety precautions, while others are legal requirements. You may want to consult your local boat mechanic, but there are some things that you can check yourself. To avoid penalties, take care of legal requirements first; you don’t want to miss out on the summer fun due to missing paper work. Your registration, license, and decal for the boat should all be up to date. Consult the state’s boating guide for details on the proper registration number and decal placement, as well as where to keep the registration card. The 2012 Minnesota Boating Guide (2.8 Mb) summarizes Minnesota’s boating laws and regulations in an easy-to-read form. It supplies the information that most boaters need to know about operating watercraft on the state’s lakes and rivers. 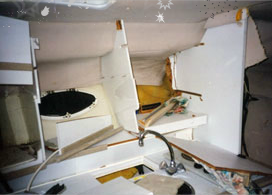 Once the paper work is out of the way, inspect the hull and all other parts of the boat for damage that may have occurred since the last time you used it. Ensure that the engine is in good working condition, by turning it on and checking that the battery is charged. The navigation lights and all the other electronics on the boat should also be thoroughly inspected. Proper maintenance and repair are critical to your continued enjoyment of and the safe use of your boat. It is important to watch out for new cuts and crushing on the surface. Any such areas should be examined and sealed temporarily especially if the cracks are deep. 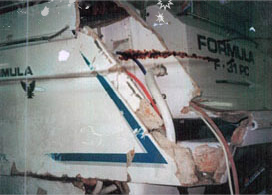 As soon as possible, the damage should be repaired properly to prevent the areas from developing into more severe structural damage as a result of material fatigue during continued use of the boat. When the surface becomes too worn, it should be degreased, cleaned and abraded properly to give good adhesion for a fresh layer of topcoat or paint. Above the waterline, a good quality marine paint is often a quicker, short-term solution than applying new topcoat. Paint has a glossier surface, and more easily repels dirt. However, gelcoat builds up thicker and generally resists mechanical wear better. 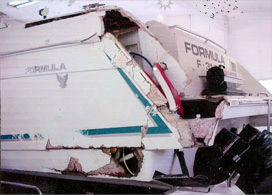 Over time, the fiberglass exterior and underside of your boat may become damaged. 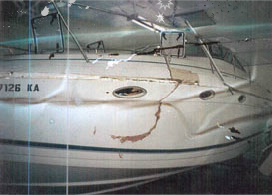 Whether caused by a storm, collision, or just normal wear and tear, once damage has occurred, it is imperative to quickly get the damage repaired to seal out moisture and protect your boat or watercraft from further damage. Damaged inside and out in the Florida hurricane. Anchor Marine repaired all phases of this boat to pre-accident condition. The boat was surveyed twice after the repairs, and was found to be prefect. As anyone who has ever owned a boat knows, they are bound to suffer damage. From dents and scratches to corrosion, and holes, our boat repair technicians will expertly repair, replace, or refinish your watercraft’s aluminum exterior. 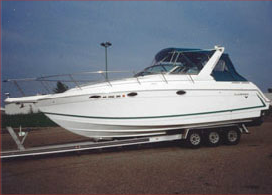 If your boat has been in a collision, showing wear from years of trailering, rocks, and docks, have it repaired by a reputable Minnesota boat repair company that has experience in collision, structural, and storm damaged boat repair to ensure it remains in first-rate condition and continue to operate properly.